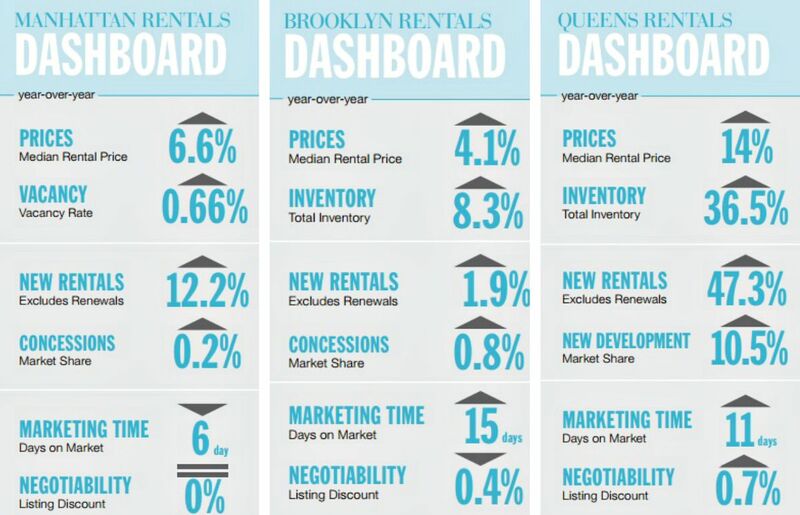 We always hear that the summer months are the worst time to move, and the July rental report from Douglas Elliman confirms this belief, as median rental prices rose in Manhattan, Brooklyn, and Queens. Like they did in June, median Brooklyn rents set a new record, rising 4.1 percent to $2,968, just $450 less than the median Manhattan rent. If you thought you could seek refuge in Queens, you’d better go to your plan B; the borough’s median rent rose 14 percent, coming in at $48 above Brooklyn, also setting a new record after several months of decline. And unlike Manhattan and Brooklyn, large apartments in Queens had higher rent increases. In Manhattan, the average rental price last month hit $4,031, and the median price was $3,418. The latter was the second highest on record, trailing only behind February 2009. It was also the 17th month a row that median rents saw growth. Also interesting is the increase in new rentals, up 42 percent from June. Currently looking for a new apartment? Be patient. Luciane Serifovic, director of rentals at Elliman, told the Daily News, “Renters are really swimming with sharks. We don’t even have to advertise our apartments anymore. We have clients lined up waiting for vacancies.” Jonathan Miller, president of real estate appraisal firm Miller Samuel and author of the report, explained to The Real Deal, “The drivers are a robust city economy with near-record employment, and tight credit. You’re still seeing many first-time buyers tipped back to the rental product.” And because of this trend, the largest price gains were in studios and one-bedrooms. Nice post and info-graphics. 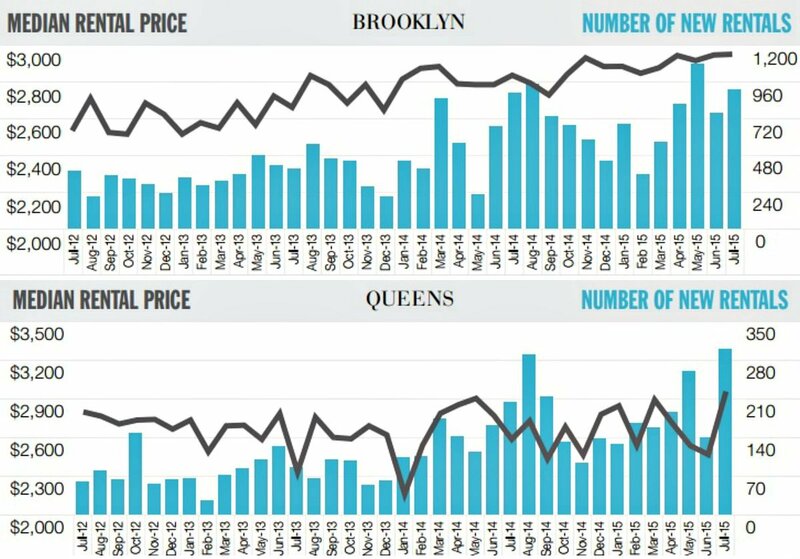 The new developments in Queens are certainly shifting prices and inventory. Are any readers looking for no fee apartments in Brooklyn or Queens? If so, hit on the previous link and go to Kings and Queens Apartments website. There you’ll have access to thousands of fee free listings throughout Queens and Brooklyn, making it possible to find something you really love. Good luck finding your next home.